Skiing is a sport you either love or hate. That feeling of adrenaline as you speed through fresh powder or those fun family ski weekends. But as you get more confident and quicker, the risk of serious injury to the knee also increases. Improved ski designs over the last few decades mean we can go faster, but the faster you ski the harder you fall. Ski manufacturers are now working on smart bindings that auto-release when they sense a fall, preventing the twisting forces on the knee that often leads to ACL damage. Unfortunately ‘electro-mechanical’ ski bindings are still several years away from widespread use. Until then, the best knee brace for skiing is your best bet for treating and preventing knee injuries while adding stability as you ski. Like any extreme sport, you’ll want a knee brace that’s both lightweight yet supportive and doesn’t limit your movement too much. Let’s take a look at how the best knee brace for skiing can make your ski trip safer and more enjoyable, before looking at some of the best knee braces available. Sleel and low profile knee brace made with strong aircraft-grade aluminum. Designed for athletes in extreme or contact sports who don’t want to sacrifice speed. Uses DonJoy’s proven four-point leverage system combined with a patented FourcePoint hinge to reduce the risk of ACL injuries. 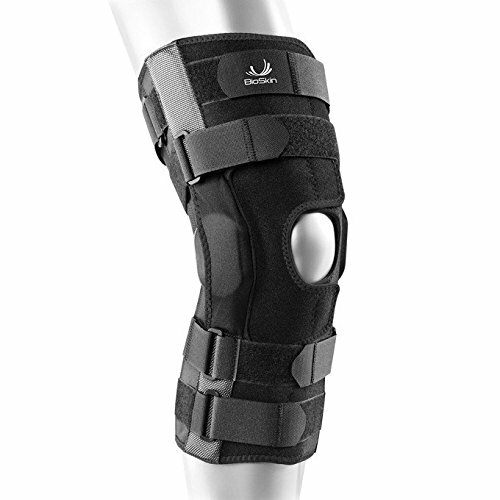 Sleeve-style knee brace with bilateral support hinges and aluminum stability stays. 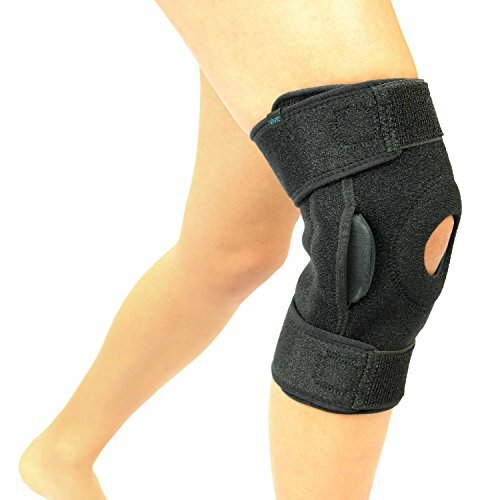 Provides compression and support to knee with open-patella and patella buttress to stabilize knee cap. X-Fit strap stabilizes knee in all directions and offers good knee protection for skiing. Latex-free neoprene brace provides compression and therapeutic heat. No gears; each side arm is independently articulated with cushioned hyperextension stops. Features McDavid’s lightest hinge ever with wider arms to maintain strength. Extra long wrap-around brace with 15-inch range of motion hinges and rigid strapping system. Uses Bioskin’s thin strong and breathable material which is hypoallergenic; guaranteed to be 100 percent latex and neoprene free. Visco-gel ring reduces swelling of the patella. Neoprene knee brace with aluminum hinges for lateral stability. Open-patella design ensures it stays on when skiing. Extra strong Velcro allows you to customize how tight the brace is and prevents constant readjustment. Knee injuries are one of the most common injuries in everyday society, after all the knee supports the whole weight of your upper body. But the prevalence is much higher in skiers with serious knee injuries increasing despite the overall injury rate falling. Knee injuries account for nearly one-third of all skiing injuries. The Medial Collateral Ligament (MCL) of the knee has always been one of the most common knee injuries with a twist of the knee often causing an MCL sprain. 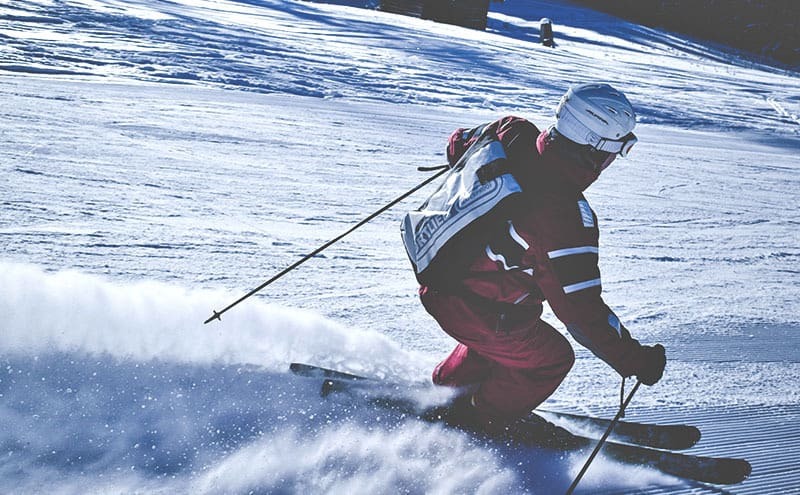 Anterior cruciate ligament injuries are also common in skiing, caused by landing from a jump onto a bent knee or landing on a knee that’s been over extended. In the following YouTube video, a Canadian physiotherapist looks at ACL injuries and how you can avoid them. Wearing a knee brace to support your knee will provide around 30 percent more resistance to the forces applied to your knee ligaments while skiing. Previously injured knees will benefit from the added support as well as helping to prevent further knee ligament injury. The best knee brace for skiing will also prevent hyperextension of the limbs, another major cause of ligament tears or sprains. Size is the most important factor when choosing a knee brace. A knee brace that’s too loose won’t offer enough support, whereas one that’s too tight will be uncomfortable to wear and limit your movement. Check the manufacturer’s sizing guide (many include specs on how to measure yourself) as it can be annoying having to return products time after time. Knee support designs have two main choices; open patella or closed. Certain injuries will benefit from being supported by pressure applied to the patella but other injuries may become worse with extra pressure on the knee cap. Speaking with a medical professional will help you to decide which one is right for your condition. Some of the less expensive knee braces are commonly sleeves with a slip-on neoprene design. Slip-on braces normally fit a certain size range and have very little adjustability. A wrap around will feature some form of locking system, usually Velcro that allows for a custom fit with hinges or support stabilizers for added support. Knee sleeves will normally offer less support but can provide compression and a therapeutic warmth for quicker recovery from knee injuries. Braces with integrated stabilizers usually feature steel or rigid supports either side of the knee for more support. The most advanced knee braces use two sections, often sleeves, with hinges to provide a lateral support system around your knee. What Is the Best Knee Brace for Skiing? There are many different options available when looking for the best knee brace for skiing, from aluminum frames to neoprene sleeves with hinges, it can be confusing knowing which is best for you. We’ve looked at many of the top-selling models to bring you five products which all go off-piste to be the best knee brace for skiing. You can be assured you’re in good company when you choose this brace as DonJoy is the official sponsor of the USA Ski Team and the preferred choice of many professional winter sports athletes. The Armor Knee Brace consists of a lightweight, aircraft-grade aluminum frame that takes the weight away from the ACL while allowing a nearly full range of motion. This brace is suitable for treating or preventing moderate to severe ACL, MCL and LCL instabilities, recovery from ACL reconstructions and prevention of hyperextension. A patented FourcePoint hinge technology helps make it less likely you’ll suffer from an ACL injury as it reduces the amount of time your knee is in an at-risk position. With an open design, there are no issues with materials bunching behind the knee and definitely no sweat. The only issue with this brace is it doesn’t offer any compression but it’s easy enough to wear some compressive thermal leggings underneath. Stronger and thicker than other lightweight knee braces. Keeps your knees out of dangerous positions. Available in choice of five sizes. Considerably more expensive than many other braces. Not interchangeable between left and right legs. This open-patella knee brace offers plenty of compression and support with two bilateral hinges for stability and protection. A slip-on design means this may get hot during any high-intensity activity but N-Tex high airflow neoprene aims to minimize the uncomfortable effects of heat and sweat. Available in five sizes you can further adjust the fit with two adjustable straps above and below the knee. Comfort comes from a four-way stretch mesh at the back of the knee and a padded patella buttress which also helps protect and stabilize the knee cap. A precurved anatomical sleeve features aluminum stability stays in addition to the integrated dual side hinges with hyperextension stops. This quality brace from Shock Doctor is ideal for preventing or healing ACL/PCL injuries while the compression supports soft tissue, joint alignment and provides a therapeutic warmth for improved blood flow. Anatomical precurved design makes this brace extremely comfortable. N-Tex air flow neoprene provides moisture-wicking compression. Finger tabs for easy grip when removing. Sizing chart is not very accurate with Shock Doctor recommending you purchase the next size up if at the top end of a size. Many customers complain of the brace slipping despite two adjustable straps. Metal stabilizing strips have been known to poke through the stitching with more active use. 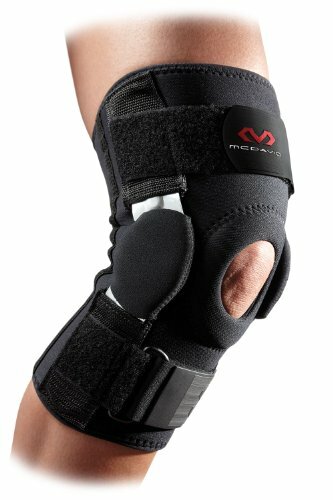 This extra-long knee brace/sleeve features an articulated steel hinge which McDavid boasts is its lightest hinge, with wider arms to maintain strength. More minimal in design you’ll get less support from this brace than others like the DonJoy we looked at earlier, but you could easily wear this under your clothing without it appearing too visibly. A latex-free neoprene is ideal for skiers who may be irritated by traditional compression sleeves with a nylon outer layer for added durability. An padded buttress goes 360 degrees around the open patella design to isolate and support the patella. The hinges are well padded to prevent them from rubbing or abrasion to the skin, with bonded edges reducing skin irritation and enhancing comfort. A perforated back panel provides heat and moisture management making this a brace you could easily wear all day. Not bulky and easy to wear under clothes. Hinges add strong support and protection. Compression provides therapeutic warmth for speedier recovery from strains or sprains. Sizing chart tends to run small. Doesn’t offer as much support as many other braces. Some customers have found the hinges tricky to operate at first. May not stay in place when performing extremely physical activities. This knee brace from Bioskin is super long at 15 inches with a visco-gel ring around the patella for optimal support, stability and to help reduce swelling. 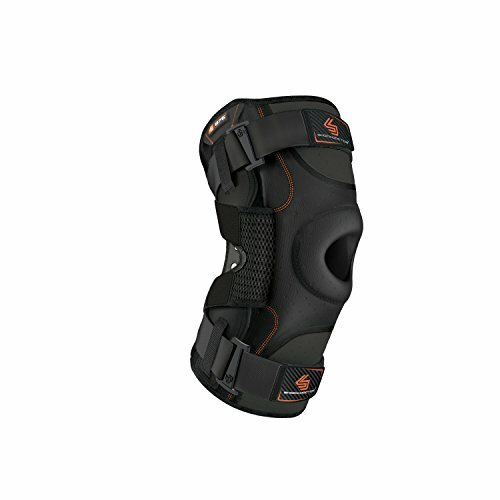 This is a great knee brace for highly sensitive knee injuries like ACL and MCL tears often experienced by skiers. Hinges prevent hyperextension and keep the knee secured and in proper alignment. This brace is easy to apply with a wrap-around design using Velcro straps to secure the brace for a comfortably snug fit. It’s made from a high-quality hypoallergenic material that’s 100 percent latex and neoprene free while being durable, thin and breathable. As the name suggests, the Gladiator brace is a very strong brace designed to help those with moderate to heavy knee ligament injuries, yet still allows you to take part in your favorite sports. Velcro straps along the length for custom fit. Hinges provide stability and support. Expensive for a wrap-around brace. Some users find extra-strong Velcro can be tiring to put on and take off again. This knee brace is marketed by Vive as being ideal for skiers with an open-patella design preventing the brace from slipping while you’re on the slopes and increasing joint stability. Extra strength fasteners keep the brace in place and allow for a customized fit with you choosing how tight the brace is. Aluminum supports keep your knee stable but can also be removed for a more relaxed fit. A lightweight latex-free neoprene provides thermal compression and is comfortable for all-day wearing. Although the material is soft to the skin, many found it’s not rigid enough and comes loose. For a budget knee brace to provide relief for moderate knee injuries, the Vive hinged knee brace is ideal to stash in your ski bag. Removable aluminum hinges for customizing support level. Breathable material for comfortable all-day wear. Doesn’t offer enough support for many customers. Aluminium hinges may take some getting used to. Fabric can be uncomfortable and itchy on the skin. Only one size offered by manufacturer. For many people who take part in athletic sports, including skiing, wearing some form of knee support can be a critical part of their everyday life. But anybody can benefit from a knee brace to ensure your ski trip ends on a more positive note. The best knee brace for skiing will offer support to your knees while preventing many common skiing injuries. If you do suffer an ACL and/or MCL injury, it may require several months of healing but a knee brace can provide support, structure and alignment to help your confidence and keep your knee in place. In our opinion, the DonJoy Armor Knee Support Brace with FourcePoint Hinge is the best knee brace for skiing you can buy today, even at its much higher price. Although it may not offer any compression, it does provide unparalleled levels of support with a specially patented FourcePoint hinge and DonJoy’s acclaimed four-point leverage system. Although less expensive knee braces are available, if you’re serious about your skiing, recommendations don’t come much higher than a brace used by the Ski Team USA.